You’ll fly with a former member of Team RUSS, one of Russia’s most famous aerial demonstration teams, or an equally qualified fighter jet pilot. Our Russian L-39 and L-29 flights take off from an airport about three hours from central Moscow. All flight programs include round-trip transportation from Moscow. Who can fly the L-39? Anyone over 18 and in reasonably good health can fly. You’ll need a travel visa to visit Russia, so advance planning is necessary. Includes 60-minute L-39 flight with advance aerobatics, video, English-speaking guide, lunch & dinner, and ground transfers from central Moscow. Includes 30-minute L-29 flight, 60-minute L-39 flight, advanced aerobatics, video, English-speaking guide, lunch, dinner and ground transfers from central Moscow. Four day, three-night VIP adventure including 60-minute L-29 flight, 60 minute L-39 flight, advanced aerobatics, video, flight suit, English-speaking guide, ground transfers from central Moscow, luxury hotel accommodations near Red Square, two guided tours and most meals. Includes two 30-minute flights with aerobatics (one for you, one for a friend, choice of L-29 or L-39) , video, English-speaking guide, plus lunch, dinner and ground transfers from central Moscow for two. Pick-up at Moscow hotel by Incredible Adventures guide and driver. Flight including aerobatics and the opportunity to take the controls. Perform loops, rolls & high-g turns. Fly inverted. The Czech-made L-39 Albatros is known for its flying ability, reliability and the great visibility from both cockpits. 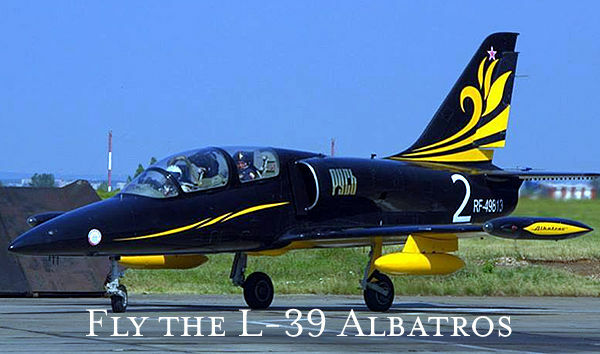 The L-39 was built as the successor to the aircraft company’s earlier trainer, the L-29 Delfin . Design work began in 1966, and the first prototype made its initial flight on 4 November 1968. The aircraft was to serve as the primary jet trainer for the Warsaw Pact. The incredible L-39 is still used by more than 30 Air Forces around the world. The Aero L-29 Delfin was Czechoslovakia’s first locally designed and built aircraft. More than 3000 of the military jet trainers were built. The L-29 has been used in active combat and is known for its durability and ease of handling. Many were supplied to the Soviet Air Force and used to train Russian fighter pilots. Today, the L-29 is popular with air racers.